Well look at that. Someone truly loves you. Or they're trying to buy your love. Either way, a shiny new iPad 2 is currently siting in your lap. I think you just won [insert holiday of choice here]. If you haven't installed iTunes on your computer, now's the time download it. Don't worry, we've got plenty of eggnog handy, we can wait. Got it? Good. Now dig around in the iPad box and grab the 30-pin cable that came with your iPad and plug that slab of awesome into the nearest USB port. 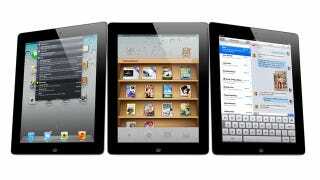 If you already own an iPad, iPhone, or iPod Touch, you'll probably want to pare down the apps that sync with your iPad. Some of those iPhone apps won't look so hot enlarged on your iPad's 10-inch display, and you don't want them taking up all your precious storage. Fortunately, iTunes does a lot of the work for you. Apps are already segmented between "universal" apps (that work equally well for iPhone, iPod Touch, and iPad) and apps that are designed specifically for a given device. Which means: go ahead and sync all of the universal apps you already own, then either track down the iPad equivalents (often called [app name]HD in the App Store) of the iPhone apps you love, or stick with the iPhone version and settle for some wonkiness. To choose which apps get synched, just check or uncheck the associated right-hand box in iTunes. If you're new to iTunes, you'll need to add all your music, videos, and ringtones. When you plug in your iPad for the first time it'll ask if you want to sync all your videos and music. Yeah, you probably don't want to do that. Instead, create playlists of music you want added to your iPad for easy management and, more importantly, to save space. Likewise, you should manually select the videos you want synced to your device. Your iPad also handily comes pre-loaded with iOS 5.0 and iCloud. Check out our iOS 5/iCloud set up guide. It'll help you get all your contacts, email, and calendar on your iPad. Even better—for those of you with Alexandrian music libraries—you can always pony up $25 and iTunes Match your way to cloud storage galore. Use this step-by-step guide to get set up. Now for the most important part. The apps. There are over 500,000 of these suckers in the App Store, and sorting the digital wheat from chaffe can be a daunting task. Fortunately, we've done it for you! Check out our essential iPad apps here and download the ones that appeal to you. The iPad is a tremendous technological achievement, but at the end of the day it's a giant, expensive piece of glass. So get a case, please, before your fancy new toy because a fancy shattered platter. Thankfully, the world is overrun with iPad covers. Traditionalists might be drawn to the faux-book stylings of the Dodocase, while klutzes will be best served by the indestructible G-Form Extreme. Or Apple's standard issue Smart Cover, which provides minimal protection but instant-on functionality. Or if none of those tickle your fancy, there are plenty of cases we've covered in the past that you might enjoy slapping onto your new iPad 2. Enhance your iPad with swanky accessories that will make your experience more iPaddy. That's a thing right? iPaddy. You've got the basics down. Your iPad is full of apps, music, and videos. You've wrapped it in a protective case, and you've synced all your information to it. If you're feeling like going the extra mile, check out our ever-userful 11 tips and tricks. Of course, you could just spend the rest of the day enjoying your iPad. Merry Christmas!